The pumpkin habanero plants and seeds will be available for sale for the first time during Rutgers Day on April 29. Researchers say the pumpkin habanero was an accidental discovery. They didn’t set out to develop a pumpkin-shaped pepper, but were trying to breed a variety that would be disease resistant, have a unique taste and appearance with high nutritional content. The pumpkin habanero is high in antioxidants, calcium, magnesium and beta-carotene. 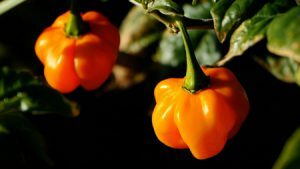 It was developed through traditional breeding methods by crossing varieties of Mexican and African habaneros over a six year period, Ayeni said. Habanero peppers. Photos courtesy of Albert Ayeni, NJAES, Rutgers University. “The market for locally grown ethnic foods continues to expand,” Ayeni said. 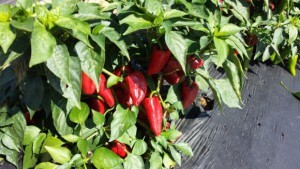 “We want to encourage growers to consider ethnic specialty crops so they may target production to meet the rapidly growing demand in the United States. These crops lend themselves to year-round production for sale, including at farmers markets. Since 2010, Albert Ayeni, ethnic crop specialist, Tom Orton, extension specialist in vegetable breeding, and Jim Simon, distinguished professor of natural plant products, have been evaluating the agricultural attributes of more than 40 exotic hot peppers at Rutgers Agricultural Research and Extension Center (RAREC) in Bridgeton, NJ; the Rutgers Snyder Research Farm in Pittstown NJ; and in New Brunswick on the Rutgers Cook Campus at Horticultural Farm 3.